Carney's Irish Pub and Restaurant is now open in Amity Village, so make sure to stop by! Check below for all events and news. Located at 136 Broadway Avenue, Amityville, NY 11701. 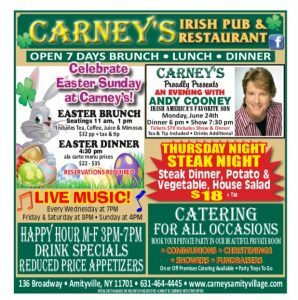 Carney’s is open seven days a week for lunch and dinner, with brunch on Sunday and Happy Hour on Monday-Friday from 3-7pm, which includes drink specials and reduced price appetizers. Carney’s Irish Pub and Restaurant also offers to cater for all occasions. Fully equipped with a private party room with seating up-to 100 guests!